Editors at the Ishinomaki Hibi Shimbun, the city's daily newspaper, printed news by hand in the wake of the deadly earthquake and tsunami. At the Newseum, you’ll find a vast collection of newspapers chronicling important events in our history, and the way the media portrayed them. But a new exhibit will show something just as unique as it is rare. 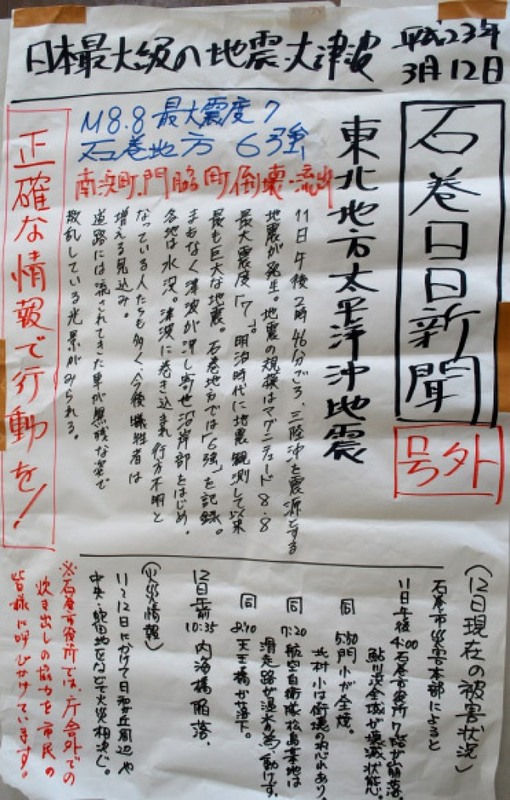 When last month’s massive earthquake and tsunami knocked out power and printing presses to a newspaper in Ishinomaki, Japan, journalists resorted to handwriting the news on poster-size paper for six days. They used flashlights and marker pens to write their stories, and they posted the newspapers at relief centers across the city beginning March 12. Six staff members collected stories, and three spent more than one hour every day handwriting the newspapers. Now, the Newseum (555 Pennsylvania Ave. N.W.) has acquired seven of those original newspapers from the Ishinomaki Hibi Shunbun for its collection. The museum plans to put them on display by May 2 in its World News Gallery. On the Newseum's website, curator Carrie Christoffersen says the poster papers show the journalists' commitment to informing their community. The site notes: "Throughout history, journalists have found ways to deliver the news when normal methods have been hampered. During the Civil War's Union siege of 1863, newsprint was so scarce in Vicksburg, Miss., that The Daily Citizen printed on wallpaper."